Thank you to St. Vital Centre for their ongoing support through their Behind Closed Doors Charity Event. The evening was a great opportunity to raise money and connect with people in our local community. Our staff and volunteers met so many people with connections to Jocelyn House Hospice, Jocelyn Hutton and her family. We are look forward to being a part of St. Vital Centre’s 10th Annual Behind Closed Doors Event in the fall of 2019! Watch our Facebook for details. On October 10, in Celebration of World Hospice Day, local artists generously donated their time and talent to support Jocelyn House Hospice. It was a great evening of entertainment featuring the Amadians, Big City Filter, Casati, Curtis Newton, Dan Deeds, Double the Trouble and Garrett Neiles. The crowd was brought to their feet as they enjoyed some of their favourite songs from the Silver Screen. Thank you to our generous sponsors Wow! Hospitality Concepts, Shape Industries Inc., Never Alone Foundation, Kim McCartney - Richardson GMP, Terracon Development Ltd., Wellington-Altus Private Wealth Inc., Cambrian Credit Union, 99.9 BOB FM, Winnipeg’s Classic 107, POP Entertainment, Guppy Design and Print Shop by Vantage for their support of this fun event! Please join us for the 7th Annual Band Together Concert on October 24, 2019 at the West End Cultural Centre! On June 14 women gathered in friendship, at the Fort Garry Hotel, to support the quality end of life care provided at Jocelyn House Hospice. They enjoyed delicious food, great company and heard a heartwarming story of the power of friendship in different stages of life. One lucky winner went home with a $5000 raffle basket filled with prizes perfect to share with her friends. and Petals West and Freeman Audio Visual for their support. Please join us for the 4th Annual Friends for Life Luncheon – Wednesday, June 12, 2019 at The Fort Garry Hotel! On Sunday, May 6 Jocelyn House Hospice hosted our inaugural Hike for Hospice Palliative Care. Thank you to our partner Palliative Manitoba, supporter Winnipeg Goldeyes Baseball Club and sponsor Save-On-Foods. It was a beautiful morning and everyone had a wonderful time. 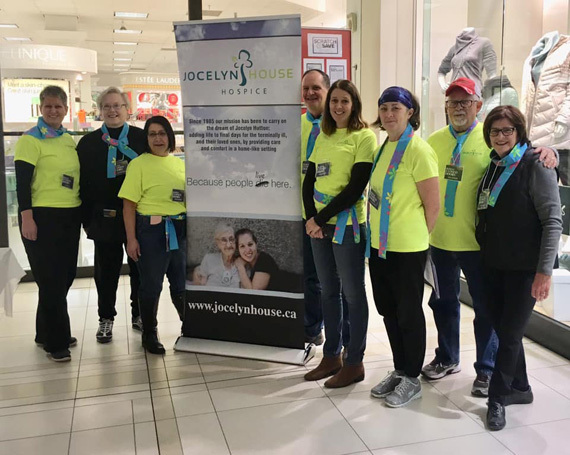 The proceeds of the Hike help us to carry on the dream of Jocelyn Hutton: adding life to final days for the terminally ill, and their loved ones, by providing care and comfort in a home-like setting. 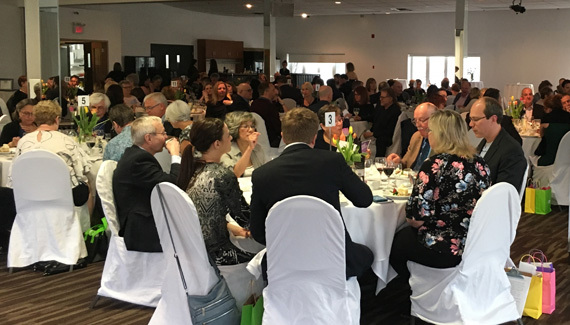 Our 9th annual Sunday Supper, held at The Gates on Roblin on April 22, was once again a great success thanks to the generous and ongoing support of our sponsors and donors. Guests had a glimpse into life at the hospice through the eyes of guest speaker and volunteer Shelley McFeetors. 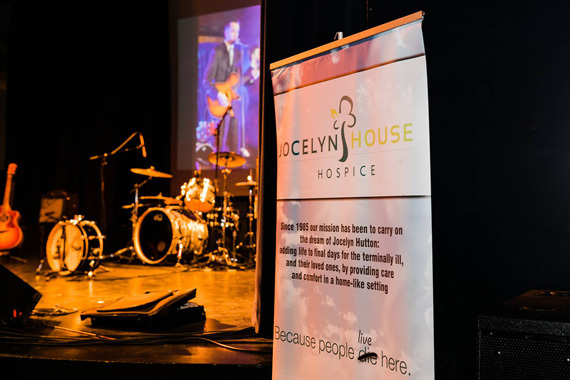 Everyone generously supported the exciting auctions to raise much needed funds for Jocelyn House Hospice. and Asphaltec, Banville & Jones Wine Co., Bee Clean, Brad's Window Cleaning, Mary Donahue, Fusion, Glenwood Draperies, Christian LaRiviere, Maple Leaf Construction, Master Roofing, Minerva Painting, Network Adjusters, Gilles Paquette, Hart Pollack, The Gates on Roblin, Top Hat Florists, True North Sports & Entertainment, Wescan Electrical and Wow! Hospitality for their generous support! Please join us for the 10th Annual Sunday Supper – Sunday, April 7, 2019 at The Gates on Roblin!